I thought I'd do a quick note on Rayman 1 (PS1). In particular, I noticed that there are some interesting discussions on the internet regarding which is the hardest Rayman 1 level. I thought I would lend my weight to this thread. It appears to me that many seem to suggest that Picture City is the hardest World in Rayman 1; I can certainly see how that might be the case. For example, Pencil Pentathlon certainly annoyed the heck out of me, especially with the precision in which you had to use Rayman's helicopter power to navigate the needles/drawing pins without bouncing on the bouncy cushions; furthermore, Space Mama's Crater was also pretty unforgiving especially in that section where you had to time Rayman's jumps as he moved along a pencil sharpener to avoid a spikey death and/or falling into the void. Space Mama herself was also a difficult boss to get used to ---- it wasn't because she was that HARD, but it was the psychological effect of knowing that, if you did not beat her, you would have to repeat Space Mama's Crater. So I'd agree that the hardest World is Picture City on an overall basis. However the level (or more accurately, section) I hated the most was definitely Band Land's Allegro Presto, Part 3. I simply had so many issues dealing with the slippery musical staves that it was not funny!!!!!! If I had to compare Rayman: Origins and Rayman: Legends with Rayman 1, I'd say there simply is no comparison in terms of difficulty level. 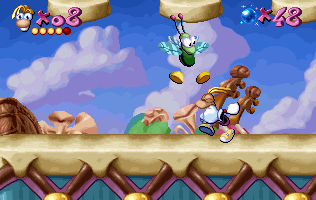 Contrary to the former two, the margin for error in Rayman 1 is so unbelievably small. However, notably, Origins' Land of the Livid Dead and the Fickle Fruit speed-run were fairly hard. Mecha No Mistake's speed-run I have not actually completed because that is just more frustrating than anything else and I simply did not have the patience to deal with that!!! My most resented enemy is probably the Moth (more a Grasshopper to me), given their tenacity, ability to dodge punches and counterattacking skill! Fighting two at the same time is deadly! The Spider in the Caves of Skops can also be pretty annoying if you let them fire their homing missiles at you. Bear in mind though that I use unlimited lives for Rayman 1 -- if I didn't have access to this cheat I would certainly not be able to get very far in the game. I am currently on Mr Skops' Stalactites.